Maybe it was the graphics, maybe it was a deep subconscious connection to the Brand Shoei itself, I dunno, I've just always worn them. But in the last year I had started to notice that my GT-Air, now over 3 years old, was really starting to cause a lot of pain across my forehead. Yes I had noticed it before but always thought, toughen up FFS. I used to get asked multiple times ‘are you alright?’ by strangers when removing said helmet as I would have a harsh red strip across my forehead Harry Potter style. Yeah, I’m fine I would say and then go about my biz. But it really became noticeable this year on the ADR and I was getting quite jack of it. And so the Great Helmet Hunt of 2015/2016 began. I tried everything (or so I thought) and even bought a Nexx XD-1 online, only to have it delivered and find out it was too big and I wasn’t happy with the finish and build quality internally anyway (it was scratchy inside - seriously, WTF?). Too expensive to return, because shipping back from Australia to Germany was a third of the price of the helmet. Buying online has it’s advantages of course, price being the main one, but it also has MEGA disadvantages - like not being able to try before you buy and ridiculous return shipping prices. And it does nothing to help our local businesses here in Australia either which I do like to do when possible. 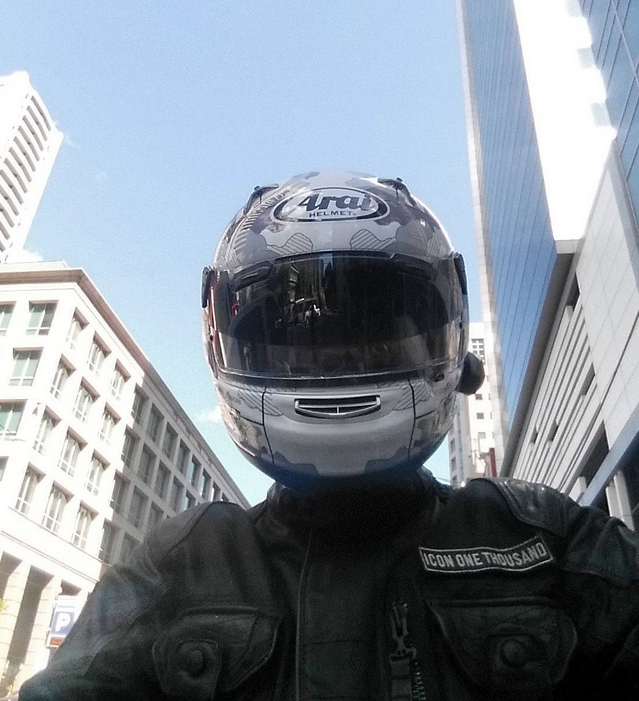 So I went to every motorcycle shop that exists in Melbourne and tried all sorts of brands and helmets to no avail. One shop even told me that they couldn’t sell me a helmet because none of them fit correctly, thought process being I was right in-between L and XL. This is utter BS as any sizing chart you read will tell you that a 61 -62 cm head measured correctly, is an XL. So I kept coming back to the Arai XD-4 dual sport, which I have spoken about here before. I have a thin, long face and an oval shaped head that measures 61 cms, but it just did’t really work for me, especially on long distance for several reasons. I took it with me recently on a trip back to Adelaide, carrying it in my top box and alternating it between the GT-Air and the XD-4, and the XD-4 was more comfortable by miles, but the drag it caused was unbearable. I hit some pretty wild weather in terms of howling cross winds on long flat plains doused with lashings of pouring rain, and that was where the XD-4 really fell over. For that reason alone, I had put Arai as a brand, out of the consideration and bypassed all of them. Then one day I was catching up with another mate, Wombat, in the city for lunch and a wander around the bike shops and complaining about my sore head when he said, “do you remember when I leant you my Freddie Spencer Arai and Kawasaki GT 750 for a bit to get a feel for it?" I nodded and realised my mistake immediately. Just because the XD-4 didn’t work for me, maybe another Arai would? You've heard all the talk about an Arai shape vs a Shoei shape before, well it's totally true. I picked up a top shelf Arai Corsair with a stunning IOM TT graphic (see below) in XL and slipped it on, it was like putting my head inside a bag of cotton candy (as Wombat explained it). It fit perfectly. It wasn’t too lose, it did everything it was supposed to and it was so comfortable I almost wept. I had found my head shape, now to find the lid I really wanted. 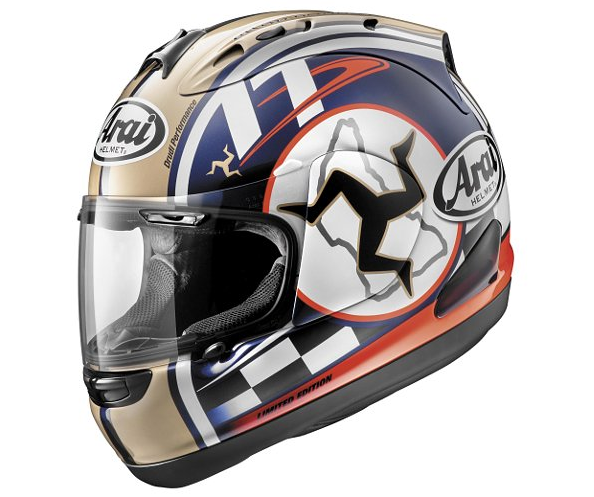 In fact, I was so very tempted to grab that beautiful Arai I tried on, the limited edition graphic was so cool I just wanted to take it straight away. 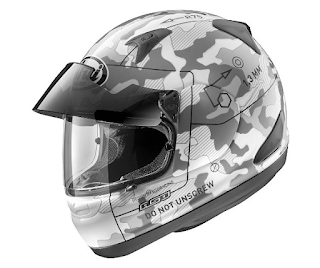 But I restrained because it really was a race helmet, and so began my internet research. 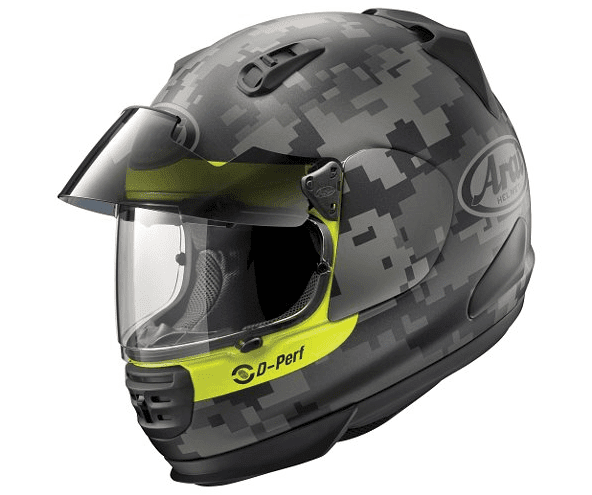 Interestingly, there are only a few models of Arai that seem to make it to Australian shores. I am certain this is due to our ridiculous laws and requirements which have only recently been updated. It is still unclear exactly what this means but as far as I was concerned the gloves are off. Arai happens to be the only helmet that does not support/make a helmet with an internal visor, and in my view, this was one of the best selling points on the GT-Air that I had been wearing for years. I wear long distance glasses and a helmet must have channels for that and an internal visor is a huge tick in my book. I am also quite sensitive to sunlight and heat due to my MS, so a white lid is a big plus also. 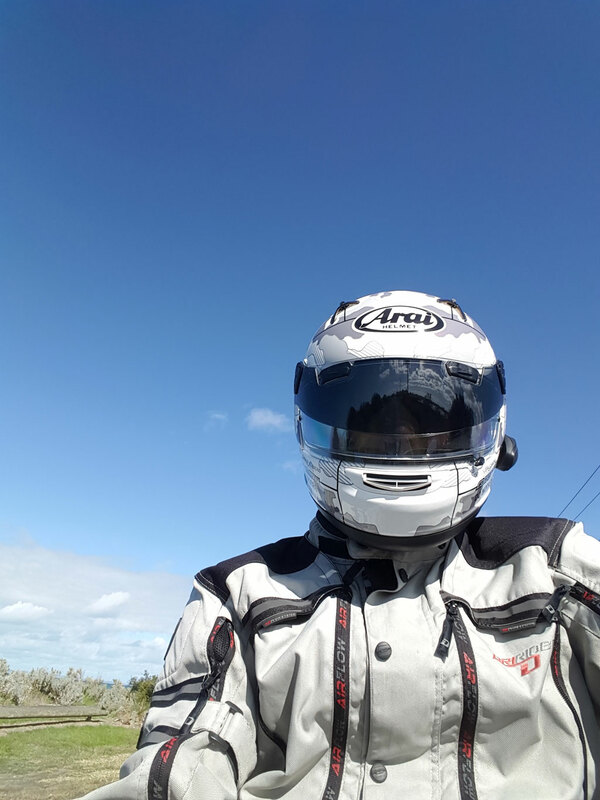 The reflective properties of a white helmet were fully realised by me on a 4 day ride during a 44 degree celsius heatwave. White lids repel heat. It’s that simple. So I started hunting down Arais' here in Australia, to be completely disappointed. Most stores only carry a few Corsairs and a couple of the other models lower down the price range, none of which had internal visors. But then discovered that Arai had indeed given this much thought. They found that all internal visors do not meet SNELL ratings, some of the toughest regulations to get around. Their solution? The Arai Pro Shade system. It acts as a (small) peak giving it a touch of a dual-sport feel, and with a simple flick down it acts as a sun visor. Wahoo! I really liked the look of the Defiant in this colour scheme, but definitely didn’t want another dark or black helmet. Which lead me to the Signet-Q-Pro Tour. It was predominantly white with an unusual grey cammo look. And it had the Pro Shade System. Plus it had the Long Oval shape I had found out suited me to a tee, as well as ear cups that were suited to fit Bluetooth comms systems. It also boasted an extra 5mm space front to back allowing for larger, bulbous noggins - like mine. Everything was adding up! I was convinced this was the lid for me. I couldn’t get any local dealer to get one for me, so off to the Internet once again it was. I chose Revzilla as my place of choice as I had always had excellent experiences with them, their customer service is outstanding, their prices were spot-on comparative to what I could get the beautiful Corsair IOM TT lid for here, and they ship FAST to Australia. Place my order on a Friday night with a knot in my stomach hoping I was doing the right thing, the following Tuesday my new lid arrived. They double boxed it for extra protection and it included a PinLock to boot. I was leaping around the place like a lunatic, so excited and nervous with trepidation I slipped it over my head and breathed out and exultant ‘ahhhhhhhh’. It fit perfectly! I actually sat in my office drawing like a total dork, wearing it for a full hour without any pressure points causing pain. This is a top notch, high end quality helmet. The build quality, the finish, the features and the overall look and feel is second to none. The lining is fantastic, not scratchy or harsh at all like the cheaper Nexx I had ordered (and sold on eBay 2 days later), and the Pro-Shade system was quite simply, glorious. My glasses do slip into the channel as expected, but I am finding that they do not quite go over my ears, which is a bit weird and more to do with my glasses style than anything else, but I am coping with it for all the other plusses it does have. Removing the visor is a bit of an ordeal, and very different from any Shoei I have used before, but I took it slow and read the instructions and got it off without a snag. Getting the PinLock fitted was also a bit fiddly and frustrating, but once done works like a charm. 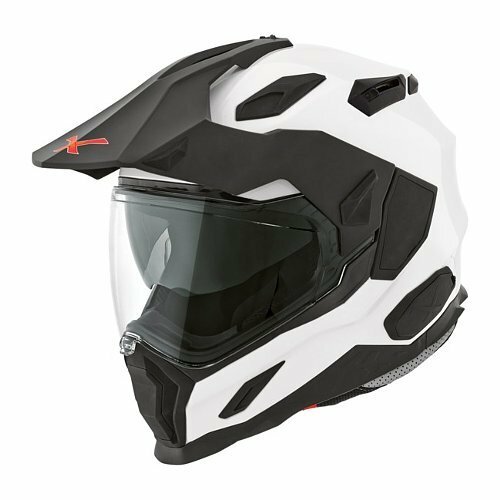 The other big plus is the sleek locking system on the visor itself, with a glove on you simply slide it back to lock in the down position, but push it forward one notch and it cracks open just the slightest bit to increase in-helmet airflow. Brilliant. Fitting the Uclear HBC-200 was probably the most freaky thing. I felt like I was going to break it, or that I was doing something wrong with the emergency release straps. It was late, I was excited but tired and I gave it up for the night, cause I am at my worst in these conditions. The next morning fresh with a good sleep under my belt I tried again and realised I was doing it wrong and rushing the night before. Following the instructions you simply pull the chin pads back and inwards to release them, remove the chin strap and the whole piece comes out. This is where I discovered another marvel of this freaking awesome helmet. It has extra padding for fatter faces, you can remove them or leave them in, which fits my slim oblong head exactly. Pulling the cover off revealed the ear piece holes, slipping the Uclear into place was a breeze, repeat both sides one at a time and tuck the wires in neatly around the back and voila! Comms system in place. The Uclear uses a unique boom-less system that projects a ‘beam’ across the front of the chin to connect to each other, read more about it here, so I was a little freaked thinking I might not have placed them correctly. But huzzah! Turning it on and calling the other half from out in the shed revealed a perfect, deep clarity that I had not found with the GT-Air, which also did not fit the earpieces anywhere near as well as the Arai. Playing some music I discovered these purpose built ear cups produced another modern wonder. BASS! Music had BOTTOM END like I have never heard with any other comms system. Music is rich, full and not in the slightest bit tinny. Now, I haven’t done a long distance ride yet, but I will say this: the helmet is perfect in almost every way bar one. Noise. I found it to be quite a bit more noisy than the GT-Air which I found to be the quietest lid I have ever owned. On long rides I always wear ear plugs anyway and keep music at a quiet background level, so I can hear my bike as well, so I think I am good with that. Only time and thousands of kilometres will tell. Ventilation is absolutely outstanding, although the brow-vents do feel a little cheap and ‘plasticky’. To be able to ride for hours with no pressure building up across my forehead is a miracle. So far I am so goddamned happy with this helmet I want to shout from the rooftops. The are only two 'cons' considering the 'pros' - it is damn expensive, top shelf mega dollars. It cost me a cool grand AUD dollars landed, but as a wise man once said, you get what you pay for. The other one I only discovered after doing a bit of a longer ride with aforementioned Wombat. You cannot have the visor open, and the shade down. Once I have done a few thousand kays I will report back with a long term review. Until then, stay upright.